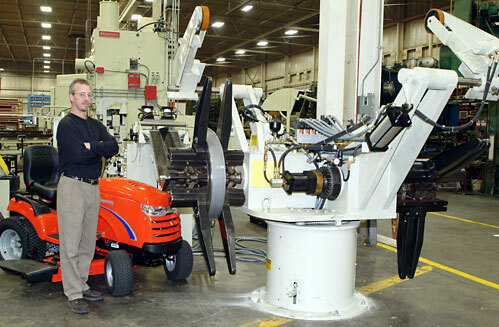 As a leading manufacturer of premium quality lawn and garden tractors, Simplicity Manufacturing, Inc., uses a lot of steel. So when they needed a new coil handling system to increase their processing capability, they installed a 12" wide Cooper Weymouth Petersen (CWP) coil handling system with the ability to handle material up to .250" thick. "Reduced changeover time and the ability to run partial coils were paramount to our equipment selection process," says John Wolfe, fabrication supervisor at Simplicity. "The CWP system we eventually selected provides both of these benefits." The coil handling system uses CWP's Model SMX12H Servomax feed, proving full-width capacity through gear-driven, four-inch diameter feed rolls. The feed was equipped with an automated, powered passline adjustment function to speed up passline adjustments when changing tooling over. To further increase changeover speed, pushbutton clamping/unclamping of the feed unit to the press was also included. At Wolfe's request, a CWP Model 4RD double-stock reel was added to provide an easier method of partial coil changeover. At 8,000-lb capacity per spindle, the reel is equipped with hydraulic expansion, inching drive and hold-down arms with powered rider roll. Each function is independently operated for each spindle. The system also features a pneumatically raised and lowered threading table to enhance the threading function. Crane Production Systems of Waukesha further automated the system by integrating the feed control with a new press control and die protection system. "We are very pleased with the new system," Wolfe says. "The increased production capacity has exceeded our expectations and we are moving unplanned jobs over to the new system based on production time savings alone." Aceros y Prensas, located in Monterrey, Mexico, has finished the installation and startup of a 48" wide by 0.200" thick cut-to-length line manufactured by Cooper-Weymouth, Peterson, a Formtek, Inc., division, in Clinton, Maine. The cut-to-length line is part of a package for a new warehouse to create a state-of-the-art service center. This strategic plan was implemented by Aceros y Prensas top management to increase productivity. The cut-to-length line is equipped with innovative technologies such as a four-roll feeder for feed accuracies of +/- 0.002". This feed system allows the machine to decrease the roll pressure by half and increase the traction surface by two, which allows the machine to work at high speeds, even with the most demanding sensitive surface materials. An automatic roll adjustment system on the straightener will decrease the setup time considerably. A direct-drop stacker is used to protect sensitive-surface materials by decreasing the drop distance. A bow tie shear with a pivot base for adjustments of +/- 3 degrees allows squaring cuts of +/- 0.012". All of the above with the CWP-exclusive auto-ready and diagnostic system, which allows the end user to operate and maintain.